My general feeling about Dark Days is that this is mostly an in-between-book. That this book is only taking you from the previous and transporting you to the next. Som big reveals, recurring characters, but nothing really new. I did really enjoy the first part, where Valkyrie tries to save Skulduggery in the dimension of The Faceless Ones. That was new and interesting and fun, after that it basically only felt lika a transportation from book 3 to book 5. Still very entertaining and I smiled several times while reading. As usual. 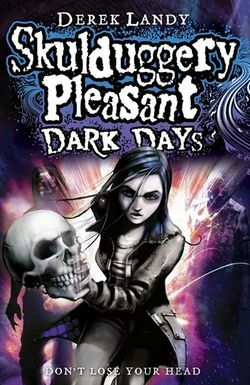 This entry was posted in Book Reviews and tagged 3.5 out of 5, Derek Landy, fantasy, HarperCollins, Skulduggery Pleasant by Alexandra. Bookmark the permalink.